When people around the world imagine England, Suffolk is probably pretty close to what they see. 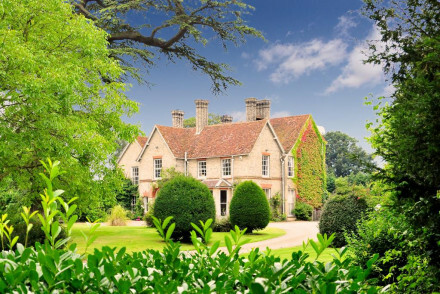 Stuffed with some of the best places to stay in Suffolk its lovely villages are full of warmth and character with huge churches, mellow halls and large greens, bordered by half-timbered houses and thatched cottages. It is intensely cosy and bucolic with a pleasant climate, lots of good places to stay and is not overcrowded like many of the Home Counties closer to London. However there is still plenty to do and see from the annual Aldeburgh Festival, to the historic village of Lavenham and abbey at Bury St Edmunds. Ipswich has a wealth of architecture to admire and Newmarket is a must for horse racing fans. Ickworth House is a divine Georgian Italianate Palace set in an idyllic rural landscape. Learn all about the house's rich history, intertwined with that of the Hervey family, and enjoy the wondrous art collection that it houses (including works by Velàzquez, Titian and Gainsborough!). A must-see for history and architecture buffs! Kids will love visiting Oasis Camel Park! The only place in the UK where you can pet, feed and ride on camels, there are also cuddle-a-pet sessions with smaller animals as well as llama walks. A fun-filled family day out. If you're into your horses then you'll adore The National Stud Tours, run by Discover Newmarket. This is the only commercial stud farm in the UK where you're allowed a behind the scenes peek at what goes on, and tours (lasting 90 minutes) cover every aspect of the Thoroughbred breeding operation. The county is an increasingly popular destination year round. So if you're planning a visit (especially during the weekends or school holiday periods) and want to guarantee a room in one of the best places to stay in Suffolk, do your homework and book well ahead. 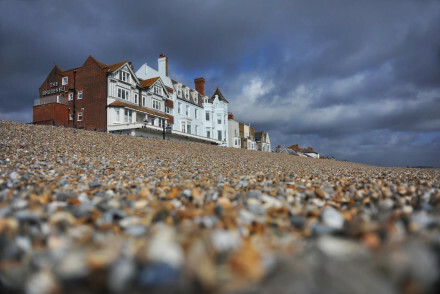 Boasting smart, traditional accommodation with antique furnishings, The Wentworth is a classic seaside hotel. Enjoy the wonderful sea views and spend your days wandering along the coast. 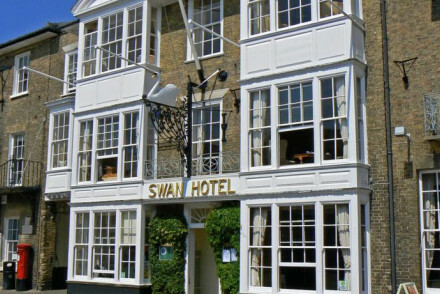 The Swan Hotel, Southwold is a lovely 4* spot boasting smart and cosy accommodation. Enjoy splendid meals at their award winning restaurant which specialises in French cuisine. A fantastic coastal retreat. The bathroom of the Earl of Sandwich Room in Sutherland House, Southwold has a slipper bath in front of an open fire. Many people would visit for that alone. This boutique B & B is family run and serves excellent seafood. Bedford Lodge Hotel & Spa exudes Georgian charm - featuring lush interiors, first-rate service and chic accommodation. Enjoy splendid meals at their Squires Restaurant and unwind in the extensive spa! The Angel, Bury St Edmunds is a historic spot, featuring a beautiful creepered façade and elegant accommodation complete with four poster beds. Classically British meals served up at the restaurant and a superb cocktail menu to boot. A superbly romantic getaway in a lovely spot. The Bildeston Crown is a country inn enjoying a quiet village setting. 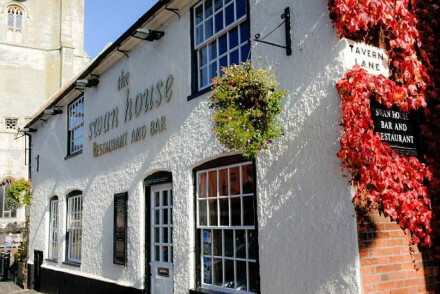 It boasts cosy, traditional accommodation and a range of wonderful dining options. A wonderful and intimate getaway. The Great House is a wonderfully romantic spot, expertly combining French chic with quintessential English charm. 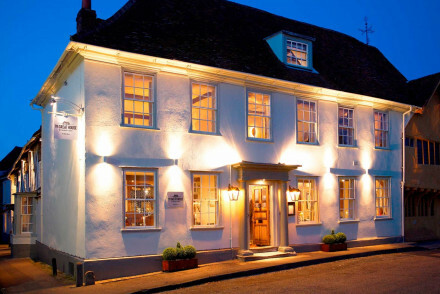 Located in the peaceful Lavenham, their 3 AA Rosettes restaurant is a delight! Characterful accommodation with exposed wooden beams and antique furnishings. 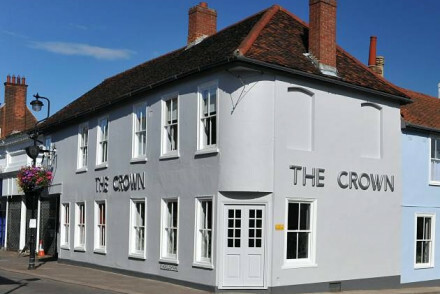 The Crown, Stoke by Nayland is a popular restaurant with rooms featuring boutique accommodation. Enjoy delicious grub made from local produce and accompanied by a tremendous wine list. A charming stay. Sutherland House is a family-run restaurant offering four spacious and comfortable rooms full of charm and period detail. You'll adore the divine meals served up at their AA Rosette restaurant and specialising in seafood dishes. 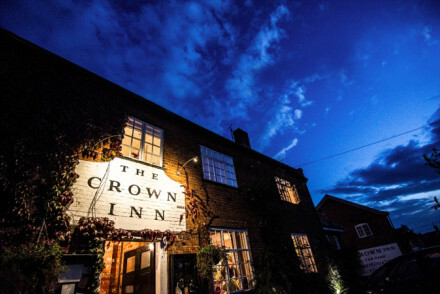 The Westleton Crown is a classic country gastropub with smart rooms.Their 2 AA Rosette restaurant serves up delicious cuisine which you can either enjoy in front of a log fire, in the sunny Garden Room Restaurant or outdoors if the weather's nice. The Ickworth, set in a picturesque stately home, is a fabulous family retreat. Complimentary creches are available and babysitting services offered, whilst there's a play room as well as a myriad of activities for the kids to enjoy in their 1800 acre estate! A truly wonderful stay. Surrounded by wide lawns and woodland, the family-friendly Kesgrave Hall near Woodbridge in Suffolk is confidently decorated with bold fabrics, tempered with warm wooden floors and muted wall colours. A hugely welcoming hotel, the public areas are generous and sociable with great food and a lovely sunny terrace on the right day. Plus, it's just a short distance from the beach! 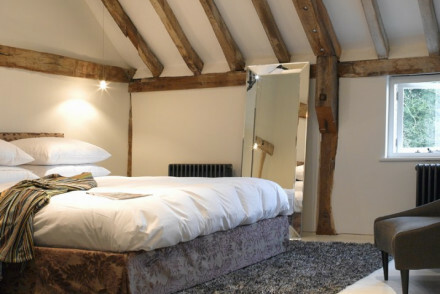 Tudenham Mill is a converted mill enjoying a serene pond-side setting and providing spacious and contemporary whitewashed accommodation with large rooms and walk in showers. You'll love the food served up at the restaurant and you can also book yourself a private wood fired cedar hot tub for the night! The Black Lion Hotel belies its rather characterless exterior to provide exuberantly opulent accommodation featuring plenty of bright hues and antique furnishings. Enjoy superb meals in their elegant dining room and curl up with a good book by the roaring fireplaces. Quintessentially English! 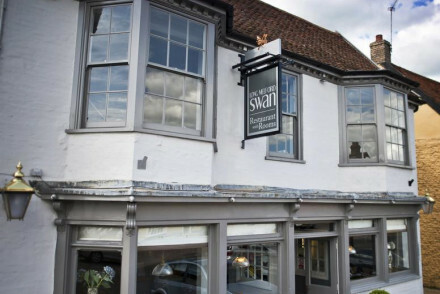 The Swan At Lavenham is wonderfully historic, dating all the way back to the 1400s! Their gorgeously atmospheric rooms feature exposed wooden beams and stylish, comfortable furnishings (including four poster beds in some of them). 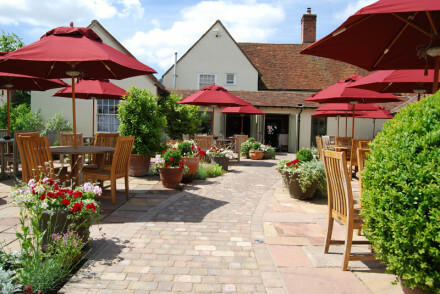 Enjoy an afternoon tipple in their quaint garden. 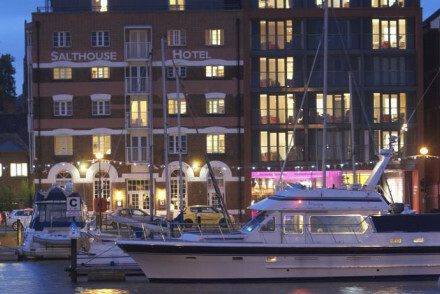 The hip Salthouse Harbour Hotel oozes modern luxury, with a wonderful setting on the waterfront of Ipswich harbour and chic contemporary interiors. Their trendy and individually decorated rooms are filled with modern art, whilst the restaurant serves up local sustainable produce. If you think a self-catering option in Suffolk would best suit your needs then check out the wide variety available at our online partner, booking.com. International visitors can fly into Stansted Airport. Alternatively, most towns are served by their own train station which is probably the best way to visit the county (unless you're travelling by car). 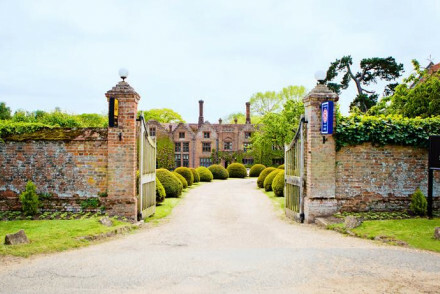 Browse through our list of the best places to stay in Suffolk and start to plan your stay. 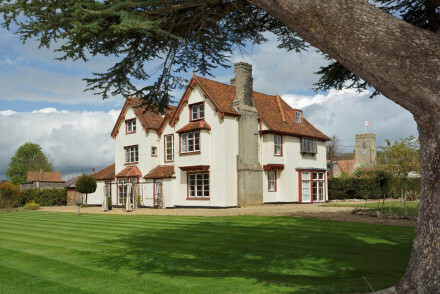 Widen your search to include the best places to stay in neighbouring Norfolk or Kent. Good food, good service, and a good night's sleep in a handsome Georgian house. Bustling bar and brassiere, lovely sunny terrace & family-friendly relaxed atmosphere. 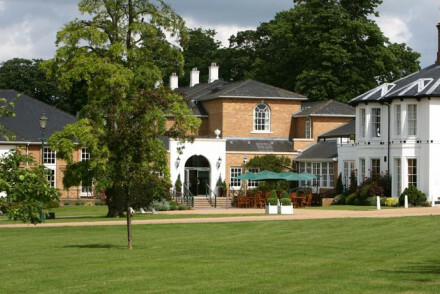 Indulgent spa hotel within easy reach of London with first-rate service and atmospheric restaurant. Georgian charm, neutral tones and lush textures contrast with the work-out drive of the gym and wonderfully cool aura of the spa. Be it racing, romance or business, you'll want for nothing. Riding - Barrow Hall Stables. Lessons for anyone from the age of 5 upwards. Great walks - City of Cambridge and Bury St Edmunds with it's 10th century Abbey. Sights nearby - Newmarket races. Saturday races. A great day out for the family. Spa - Solarium, hot tub, Hammam and sauna available. This charming property in the heart of Suffolk is set amidst four acres of beautifully landscaped gardens. There are three delightfully decorated rooms and a detached cottage. A hearty English breakfast is served every morning as well as a farmhouse supper in the evening. A home away from home! 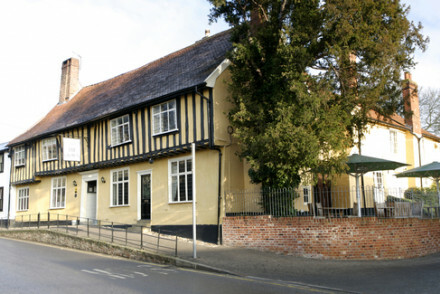 Charming guesthouse in the picturesque Suffolk town of Beccles. Boasting lovely rooms with luxurious beds and tasteful furnishings, The Swan House is a great stopping point for a weekend in Suffolk. Great walks - Beautiful walking trails run along the side of the river Waveney. Sights nearby - Go on castle visits at nearby Bungay Castle and Burgh Castle. Fabulous views and spacious, well-equipped bedrooms in this popular B & B set amidst romantic gardens and beautiful countryside. Charming lodge set in the quaint village of Polstead, on the Suffolk/Essex border. A choice of three en-suite rooms or a self-contained studio all of which are elegant and minimalist in their decor - effortlessly combining traditional with luxury. A peaceful property in Constable country. Sights nearby - Colchester Castle is just a short drive away. A country inn set in the quaint and quiet village of Bildeston. 12 refurbished rooms offer a contemporary look with a traditional feel. 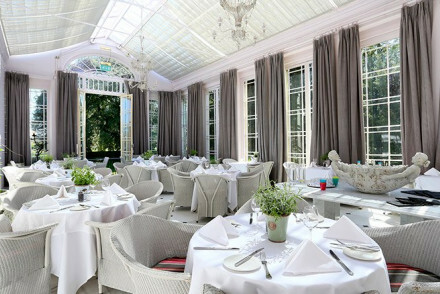 The chef offers modern british food in either a formal or relaxed dining area. Suffolk offers a host of outdoor pursuits ideal for a weekend get away. 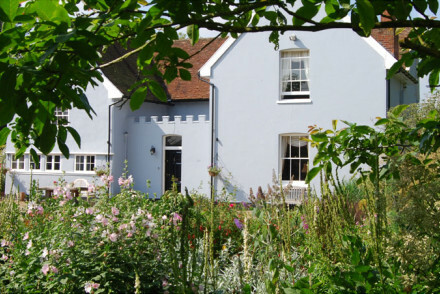 Charming B&B in the tiny Suffolk village of Haughley. There's a distinctive homely feel to Haughley House with antique furnishings and tastefully decorated bedrooms. A great base from which to explore Suffolk. Great walks - The surrounding area is a full of wonderful walking routes. Sights nearby - Pay a visit to nearby Bury St Edmunds. A stunning Rectory House set in a beautiful conservation area. Elegant rooms are traditional in style with well placed antique pieces, classic fabrics and luxurious bathrooms - the best have four posters. The indulgent breakfasts, tennis court and swimming pool make this a cut above the rest. 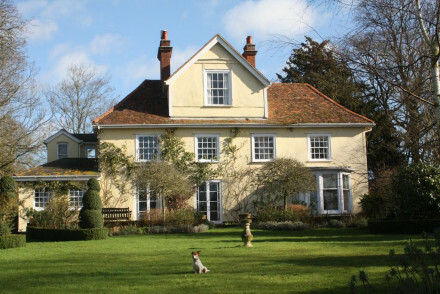 Country Escape - A picture perfect Rectory House set in equally beautiful flower filled gardens. Great walks - Take long walks through the picturesque countryside or along the coast. Sights nearby - View the mementos of Beatrix Potter at Melford Hall. Historic 16th-century listed Inn in the heart of Constable country, with original oak beams and features albeit with a modern lift. 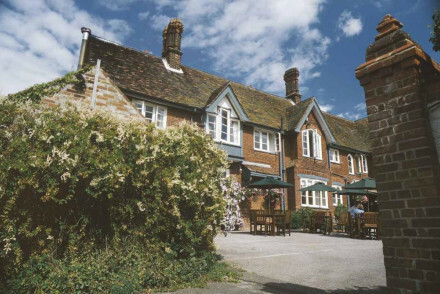 Traditional country pub at the epicenter, and restaurant serving the finest local produce. Every room is individually designed and comes with ensuite and free wifi. 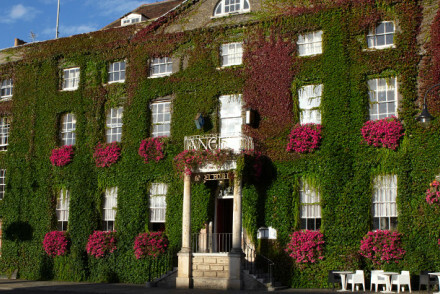 Value chic - With stylish rooms starting from just £95 per night inlcuding breakfast, the Angel Inn is excellent value for money. Family retreat set in 1800 acres of National Trust with amenities to suit all ages. Spa, cinema room, swimming pool and games room to ensure maximum entertainment and relaxation. Complimentary creche and a focus on entertaining children makes this an ideal choice for family getaway. Dogs welcome. Child friendly - Prides itself on it's welcome for children. Creche and babysitting available. 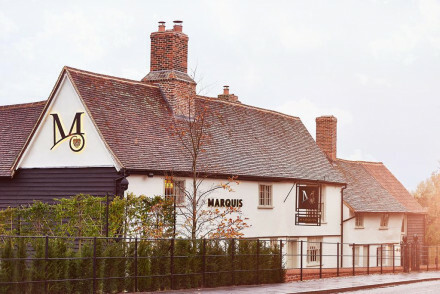 In the heart of one of Suffolk’s most perfect and peaceful medieval villages is Lavenham, and the delightful Great House restaurant and small luxury hotel. French chic meets quintessential English charm; the combination is pretty special. Family-run restaurant in a historic building in the centre of Southwold offers four spacious, comfortable rooms with modern bathrooms. The excellent seafood restaurant has been awards two AA rosettes and makes for a great base to stay in the charming seaside village. Foodies - Fantastic seafood based restaurant where everything down to the black pudding is made in house, and you taste the difference. Full of character - Many original features including pargetted ceilings and foot wide elm floorboards dating back to the 1450s! Fishing - Fishing is a popular past time with the locals, head out on the seas and try and catch your dinner. Sights nearby - Visit the local Adnams Brewery, learn about brewing and sample some of the produce. A charming B&B set in a beautiful country home. Housing just four individually styled rooms all featuring egyptian cotton sheets, soft hues and traditional furnishings. The extremely warm host goes above and beyond with nuggets of local knowledge, home-made high-teas and indulgent breakfasts. 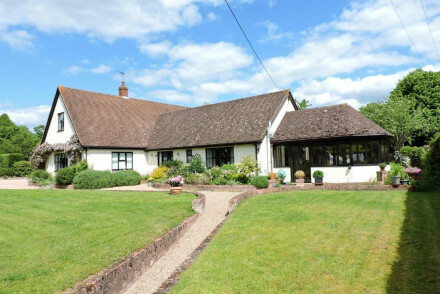 Country Escape - A pretty country house in a secluded spot. Great walks - Take long walks straight from the property or drive to the sandy beaches of Frinton, Walton and Felixstowe. Sailing - From Dedham hire a boat and sail on the River Stour. A seriously stylish pub with rooms in the village of Moulton, just a short distance from Newmarket. Chic rooms are contemporary in style, think plenty of light hues and wooden furnishings. All are individually designed, some with feature bath tubs. An idyllic rural getaway with great food too. Truly historic and luxury B&B in the classic English town of Woodbridge. 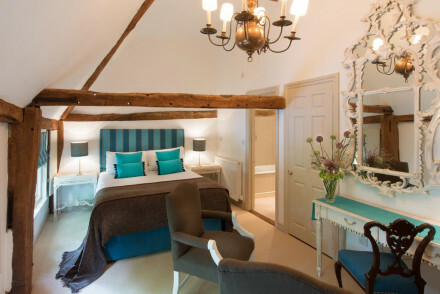 Two 14th century rooms and one contemporary room all with en-suite. Original historic decor with beams & ships timbers and delicious breakfast served in the original medieval kitchen. Stunning one of a kind! 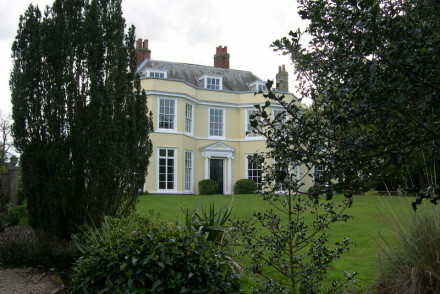 Writing a novel - Writers and novelists will be inspired by the truly historic architecture and character of Hill House. Sights nearby - The Anglo-Saxon burial site at Sutton Hoo is a short drive away. A majestic building set in beautifully manicured gardens. Elegant rooms are light and spacious with traditional furniture and fabrics. The best (the Seckford or Tudor rooms) feature antique four poster beds. A spoiling spa and excellent restaurant make this a special stay. 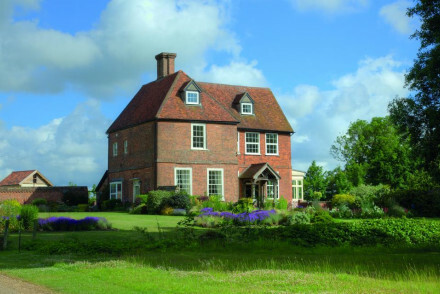 Country Escape - Easily accessible from London and surrounded by some of Suffolk's most beautiful countryside. Great walks - Take long walks along the coastal path. Sights nearby - Visit the Viking site of Sutton Hoo. A beautiful country house set in 26 acres of garden and pasture land. The three immaculately designed rooms are traditional in style yet not overtly fussy and all offer lovely views over the garden. The atmospheric reception rooms are ideal for an evening tipple. Rural perfection. 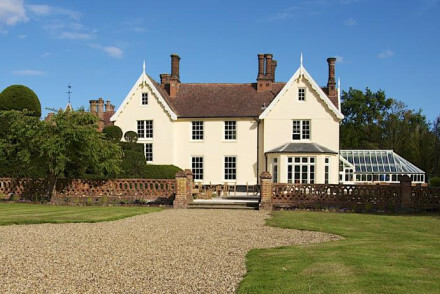 Country Escape - A gorgeous country house set in picturesque rural Suffolk. Great walks - Discover the surrounding countryside with walks starting straight from the property. Sights nearby - Take a stroll through England’s best-preserved Medieval village at Lavenham. Converted watermill with top notch contemporary interiors and a serene pond-side location. Large rooms and beds and walk in showers, excellent food, a comfortable escape from the city. 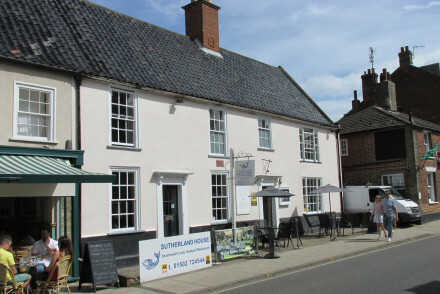 Popular restaurant in the stunning Constable country, with separate boutique accommodation. Light and airy rooms some with french doors opening onto a terrace. Great views across open countryside. Excellent food, wines and walking. The perfect escape from city life. Hideaway - An early morning walk through the Dedham Vale, followed by a long afternoon by the fire and a hearty evening meal. Foodies - Exceptional local cuisine straight from the boat or farm accompanied by wonderful wines. Sights nearby - Visit the quintessantially quaint Lavenham with it's 15th-century church and crooked medieval houses. Great walks - Venture into the Suffolk countryside and explore the local villages, dales and valleys. Well known, chic Woodbridge gastropub with rooms, close to Sutton Hoo, in a charming Suffolk village of cafes and boutiques. Good food and local ales. A charming hotel, overlooking the village Green. Classic English interiors with antique pieces, bold florals and roaring fireplaces. The award winning restaurant serves up locally sourced seasonal produce in a variety of settings, from formal dining to Al Fresco in the walled garden. A family spot. Families - An ideal spot for a family getaway (dogs and all) with rocking horses, high chairs, childrens menus and free use of cots. Value chic - A gourmet's heaven, with picturesque views of the square and magestic fourposter beds - all for a reasonable price tag. Great walks - The Green is wonderful dog walking spot just across the road, or head out of town for a longer ramble. Sights nearby - Next door to 15th century Holy Trinity Church, and just across from Melford Hall. With several culinary awards The Westleton Crown provides more than the usual country inn, Gastropub affair. Think jasmine tea-smoked duck breast accompanied by a fine wine. Rooms are bright and clutter free decorated in shades of magnolia and feature immaculate bathrooms, some with roll-top baths. Sights nearby - The 12th century fortress, Framlingham Castle, is still an impressive sight today. Birdwatching - An impressive variety of birdlife can be spotted at Minsmere RSPB Bird Reserve. Great walks - See website for plenty of scenic walks from the hotel. 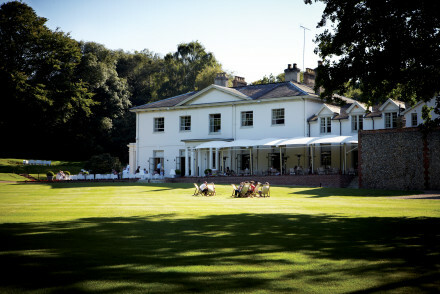 A charming hotel set in the scenic rolling countryside of Suffolk. The hotel provides comfortable and characterful rooms, mixing traditional design structures with a modern style. Downstairs the excellent restaurant focuses on seasonal recipes. Perfect for a weekend in the countryside. Country Escape - The ideal cosy base to return to after a day exploring the stunning Suffolk countryside. Great walks - Make the most of the excellent walking routes in the surrounding Suffolk countryside. Sights nearby - Families will enjoy a trip to nearby Banham Zoo Norfolk. 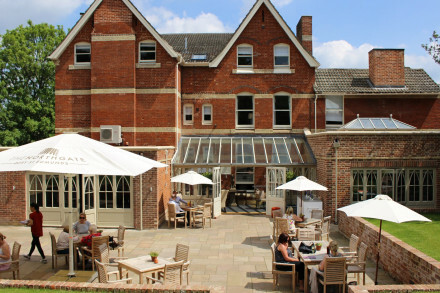 Set in the old market town of Bury St Edmunds this is an impressive historic hotel. The rooms are contemporary yet still have a traditional feel. The restaurant serves up high quality British fare. The pretty town and nature parks offer great walks. The perfect weekend getaway. 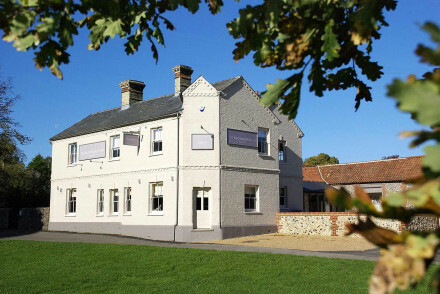 A luxury Inn set in one of Suffolk's most picturesque villages. A fantastic restaurant serves up contemporary pub fare and the bar churns out excellent cocktails alongside a well selected choice of ales. The seven rooms are all individually styled and immaculately finished. Country Escape - A luxury Inn set in a picture perfect Suffolk village. Sights nearby - Explore the National Trust’s Melford Hall, a Jacobean mansion owned by relatives of Beatrix Potter. Great walks - Take the scenic four-mile walk along a disused railway line to timbered Lavenham. 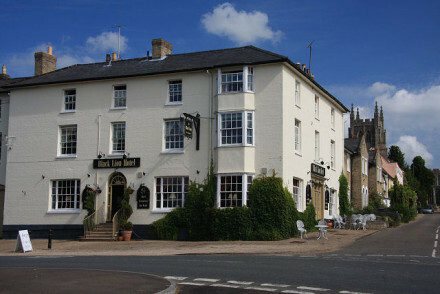 Picturesque village hotel with great views of the Brett river. A range of elegant rooms and suites where original oak beams are commonplace and complement the stylish contemmporary decor. International based menu served in the restaurant with bar, fireplaces and two terraces. Sights nearby - You're 9 miles from Ipswich and 20 miles from historic Colchester. 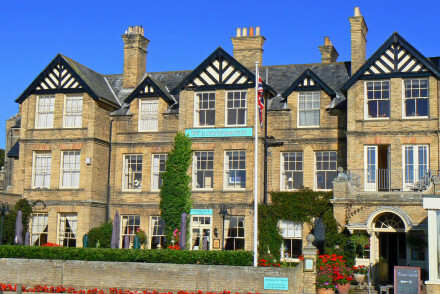 Four star hotel on the market square in lovely seaside Southwold. Contemporary comfort complements traditional charm in the rooms, some with sea views. The award winning restaurants offers French fare and is popular across town. A great base for a seaside holiday with the family. Value chic - A wonderful and historic small town hotel with exceptional views and facilities- without a killer price tag. Active Holiday - Watersports, fishing, golfing, rambling, riding and bowling are all within a few minutes of the hotel. Great walks - Just two minutes from the famed Southwold Promenade, take a stroll along the coast and breath the fresh sea air. Local markets - Southwold's market square (right outside the door) has a whole host of shops and stalls. A cool contemporary restaurant with rooms boasting a fabulous beach side location. Four individually styled rooms are light and airy with luxurious bathrooms, boldy patterned wall paper, crisp white linen and floor to ceiling windows. A fabulous restaurant feels more like a fancy beach side shack. Beach Life - Located right on Southwold's harbour with a direct footpath through the dunes onto the beach. Great walks - Take long walks along the scenic coastal path. Sailing - Hop on the iconic foot ferry to Walberswick. The Northgate is a lovely 5* property in the market town of Bury St Edmunds. It boasts ten sophisticated and classy yet understated accommodation in creamy hues, each different from the next. Superb food and a chef's table, plus a cocktail bar. Upmarket yet unassuming - one for romantics. 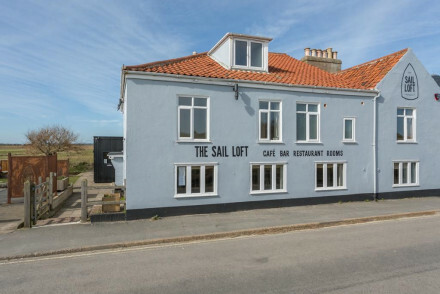 A charming “restaurant with rooms” on the Suffolk coast, with wonderful river and castle views. Ideal for exploring the area – from Aldeburgh to Orford Ness – or just switching off from everyday stresses. 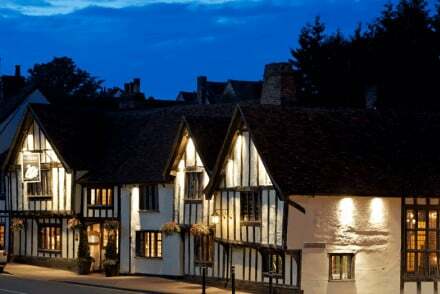 A famous old coaching inn (1400) in a classic medieval town, with 45 ancient rooms done up in 20th century luxury style. Touristy but an experience. 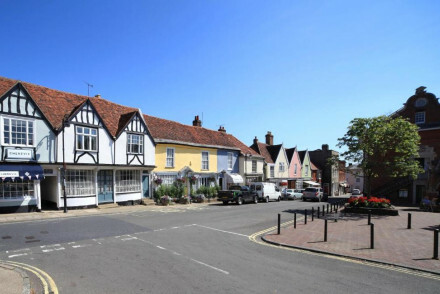 Sights nearby - Explore Lavenham one of the UK's finest mediaeval towns. Cooking classes - Culinary masterclasses available.